of Thomas and other Rebels. 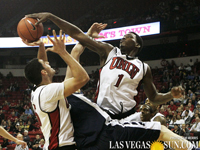 Thomas enters his third season in the Runnin' Rebel program in 2011-12 ... Transferred to UNLV from Kansas after the 2008-09 season and sat out the 2009-10 season as a redshirt because of NCAA transfer rules. Named Spring 2011 Academic All-Mountain West ... Earned a team academic award for having a 3.0 or better grade point average ... Appeared in all 33 of UNLV's games and made 26 starts ... Averaged 6.7 points and 5.2 rebounds per game ... Shot 52.7 percent from the floor ... Was 10th in the MW in rebounding and 10th in blocked shots (24) ... Was second on the team in rebounds and blocks, third in free throws made and fifth in scoring and field goals made ... Had three double-doubles, including a career-high 16 rebounds (with 15 points) against Utah ... The 16 rebounds are the highest single-game total for a UNLV player since 2005 ... Scored in double figures eight times, including a career-high 19 points at New Mexico (7-12 FG) ... Scored in double figures in six of his last 13 games ... Led the team in scoring twice and in rebounding seven times. Used the 2009-10 season as a redshirt year after transferring to UNLV from Kansas. Played in 26 games and made one start ... Averaged 1.5 points and 2.0 rebounds per game ... Shot 44.0 percent from the field and 68.0 percent from the free-throw line ... Scored a season-high 10 points and grabbed seven rebounds against New Mexico State ... Also had seven rebounds against UMKC. A 2008 graduate of Saint Patrick High School in Elizabeth, N.J. ... Averaged 16 points, 10 rebounds, two blocks and two steals per game as a senior ... Named his team's MVP ... Scored 25 points and had 13 rebounds in the Nike Super Six game against the No. 8 team in the nation ... Averaged nine points, 11 rebounds and three blocks per game as a junior ... Helped lead his team to the 2007 New Jersey state championship ... Earned all-conference honors as a junior ... The 2007 St. Patrick team was ranked second in the country and finished 30-2 ... Was rated as the 17th best player in the nation at his position coming out of high school by ESPN.com and 56th overall ... Rated 32nd in the country at his position by Scout.com and 36th at his position (149th overall) by Rivals.com. Quintrell Daron Thomas was born Feb. 21, 1990, in New York, N.Y. ... Majoring in communication studies ... The son of Tommica Thomas and Lancelot Fowler ... Has a brother, Quian (7).